Sonny & Cher captured America’s heart singing “I Got You Babe,” an anthem to unconditional love. But when their storybook romance came to an end, it kicked off a very public split — and professional reconciliation — that played out on primetime TV. Every Sunday night in April, getTV presents a brief history of Sonny & Cher’s television variety shows: from their early ‘70s hit The Sonny & Cher Comedy Hour to The Sonny & Cher Show, the 1976–77 “reboot” that reunited the newly divorced couple (at least on TV). We even have an episode of her 1975–76 solo series Cher that took place between the two! Whether you’re an original fan or are just discovering the iconic duo today, you can relive the magic and music of Sonny & Cher every Sunday night at 11p ET on getTV! Salvatore “Sonny” Bono and Cherilyn “Cher” Sarkisian first met in 1962 and soon became both creative and romantic partners. Their debut album Look At Us was a smash in the summer of 1965 with “I Got You Babe” kicking off a string of chart-topping hits. But, when record sales slowed a few years later, they were left with a decision: what next? The answer was TV. 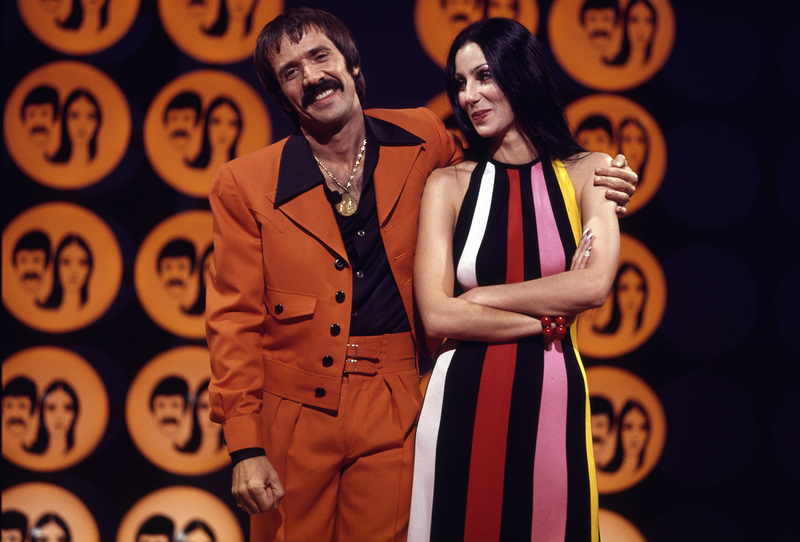 Originally planned as a summer replacement, The Sonny & Cher Comedy Hour was so popular in August of 1971 that CBS quickly gave it a permanent spot on the schedule. The co-hosts opened each show with a monologue that cast 25-year-old Cher as the wise-cracking wife and Sonny (age 36) as the put-upon husband, an unusually sitcom-like dynamic for a variety show. Sonny & Cher also brought youth appeal to the older-skewing variety format with contemporary pop acts like The Jackson Five and young talent in front of and behind the camera. Future stars like Teri Garr, Murray Langston (the Unknown Comic), and Bob Einstein (Super Dave, Curb Your Enthusiasm) were cast members, along with Ted Zeigler, Billy Van, Freeman King, and Peter Cullen (later the voice of Optimus Prime in the Transformers franchise). Despite ratings that were still in the top ten, The Sonny & Cher Comedy Hour abruptly ended when the couple split up in 1974. Almost immediately, Sonny and Cher launched their own competing variety programs on different networks. Sonny took most of the cast and crew and moved to ABC for The Sonny Comedy Revue. Cher stayed at CBS with veteran producer George Schlatter (Laugh-In), musical director Jimmy Dale, and costume designer Bob Mackie. Not surprisingly, Cher placed a greater emphasis on music. She sang throughout every episode, including duets with big-name guests like Elton John and David Bowie. Sketches were less broad than on the Comedy Hour, demonstrating more of the charisma and acting ability that would bring Cher an Academy Award for Moonstruck in 1988. While Sonny’s solo show came to a quick end, Cher’s was a hit. But, while it was an excellently produced showcase for her talents, Cher often lacked the breezy, goofy charm of the Comedy Hour. So, after two seasons, Cher made an unexpected decision: she would reunite with her ex-husband in an effort to recreate the chemistry they had shared as a married couple. The newly retitled Sonny & Cher Show debuted in 1976 and thrilled audiences for two more seasons. Chuck Connors was an athlete-turned-actor who starred in the Western series The Rifleman. Howard Cosell was a sportscaster and one of the original hosts of Monday Night Football. But for one glorious night in 1973, these two icons sang, danced, and did comedy together on the season four premiere of The Sonny & Cher Comedy Hour. Also look for Ed McMahon, Miss USA Amanda Jones, Miss Universe Margie Moran-Floriendo, and songs like “Games People Play,” “Half Breed,” and “Bad, Bad Leroy Brown” (with animation by cartoonist John Wilson). Like most sketch comedy shows, The Sonny & Cher Comedy Hour had bits that would recur from week to week. The most famous of these was the Vamp Sketch, where Cher would portray notorious women throughout history in skits bridged by music. In this episode, she and guest star Andy Griffith lampoon Miss Sadie Thompson (1953), Forever Amber (1947), and feminist icon Helen Gurley Brown. Cher also sings an Al Jolson medley and the hosts duet on “If You Believe in Magic,” “Baby Don’t Get Hooked On Me,” and “I Got You Babe” (with an adorable assist from Chastity). This second season episode of the reunion series opens with surprisingly personal material about their post-divorce life, highlighted by Cher triggering a trap door for Sonny to fall through. Guests Farrah Fawcett (Charlie’s Angels) and Don Knotts join them for sketches. Glen Campbell sings “Southern Nights” and duets with Cher on a country pop medley that includes “Rhinestone Cowboy.” And Sonny and Cher sing “You Make Me Feel Like Dancing.” This was one of the last few episodes of The Sonny & Cher Show in any form, as the show was bounced around the schedule in an effort to recapture ratings. Cher opens the first season episode of her solo show duetting with rocker Gregg Allman on “Don’t Mess Up a Good Thing.” Although she makes no mention of it, she would marry Allman five weeks later — just days after her divorce from Sonny was finalized. Allman also performs “Midnight Rider” and Cher sings “Geronimo’s Cadillac.” But the highlight of the show is Carol Burnett, who joins Cher and guest star Dennis Weaver (McCloud) for a gender-bending take on Sherlock Holmes. Carol and Cher also perform a song and dance homage to two fictional film stars and impersonate each other for a role reversal sketch. Cher is a phenomenal talent and her solo show is more focused than either version of Sonny & Cher. But there was a magical chemistry between the two that audiences clearly loved, and that has allowed their work to endure for half a century. Episodes of The Sonny And Cher Comedy Hour, Cher, and The Sonny And Cher Show air Sunday nights at 11p ET in April on getTV. For more, visit the getTV schedule.